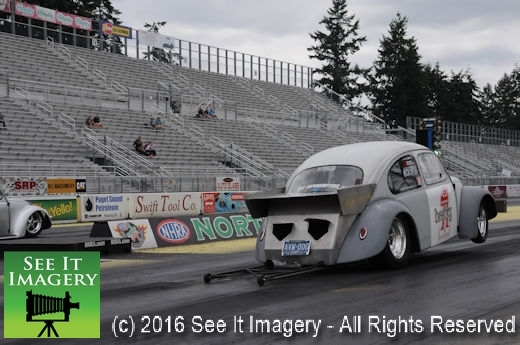 15 July 2018 Kent, WA – As an auto that came out of world war two in a time of turmoil the ways that owners of the VW brand can modify, alter and personalize is as wide as the number of them around. The swap meet, and the drag race portion of the 4th Annual VW Nationals are cool, but the car show is where it is at. Hundreds of all makes and models are on display and what each has done to his or her personal tastes, from the military uses in the war to the latest out of the factory can be seen. 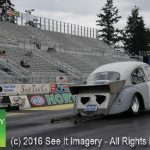 As far as the drags and how you take that VW power that in reality traces its roots directly to Porsche and as most know these are bad fast cars on the road course tracks. Here again the range of race cars is on display as some of these racers dip into the 10’s in the quarter mile. 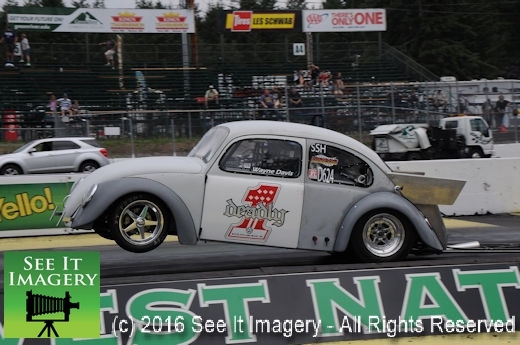 The winner’s from the 4th Annual VW Nationals are Kelly McDonald in Sportsman, Cole Johnson in Pro and John Stevens in Run Tuff. Lots of great images – click here to go to the photo album. 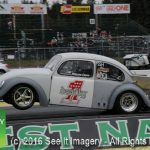 16 July 2017 Kent, WA – Bringing everything VW to Pacific Raceways for a swap meet, car show and drags has just about everything that you could and can do to autos and motors. 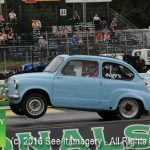 Turn it into a “rat rod” by chopping it up or throw the motor into a dragster and see what happens. If you can think it you can do it weather you scrimp and gather parts and pieces for your creation or just take your wallet out and get what you are looking for its all VW. Walking the car show you see the diversity in what can be done with the auto be it “new” or from “decades” ago. 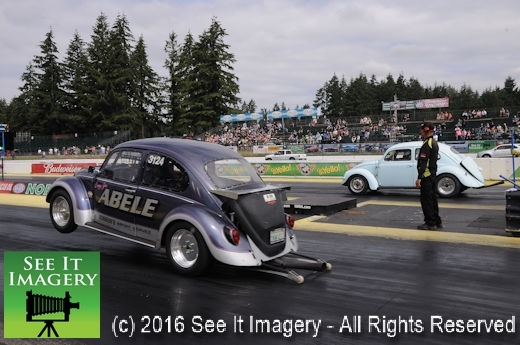 With the engine in the rear many of the drag racing “bugs” do need wheelie bars or risk dragging the exhaust on the track, and yes they will hike those front tires into the air at the flicker of “green” from the tree. This the 3rd annual event at Pacific has drawn more and more each year and next year’s event in the planning already is a date for your smart phone and it’s date reminder, find it when posted for next year and put it in as a reminder to check this action on the track and what comes from those minds in the car show portion of this event. Lots of images from all over the grounds today – show, racing and more. 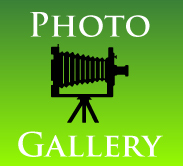 Click here to go to the photo album. 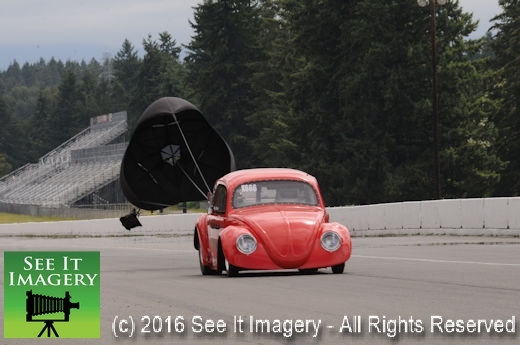 17 July 2016 Kent, WA – From Canada, Washington and Oregon VW drivers and the things that they done to them are on full display at their annual event at Pacific Raceways, the VW Nationals. The popularity of the “bug” is big and getting bigger as the original models are getting quite pricey when sold. That’s the custom end of the VW; those that drag race are all after the same thing. Though slightly different in looks they are pretty much the same when it comes to the power plant. The fact that you have to have a parachute attached to the rear end speaks loudly. 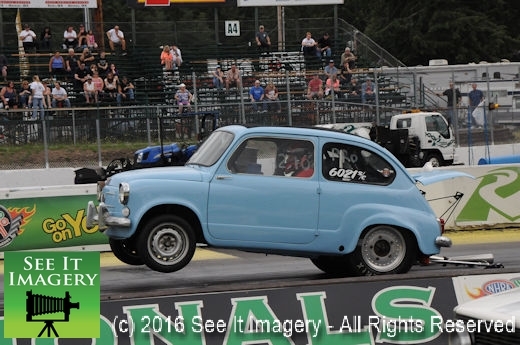 Hiking the front end onto the wheelie bars is not uncommon and they are truly getting faster. 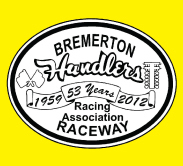 This year’s winners are in Sportsman Craig Johnson got the win and Pro class had Rocky Jennings topping the field. For the Run Tuff class Dave Wright got the trophy and for the Quick 8 Terry Hoogstins proved the best this race. Images are now online and available for purchase – click here to go to the photo album.